DOT has deferred its plan for a two-way protected bike lane on Clinton Avenue, saying it will return to Brooklyn Community Board 2 next month. 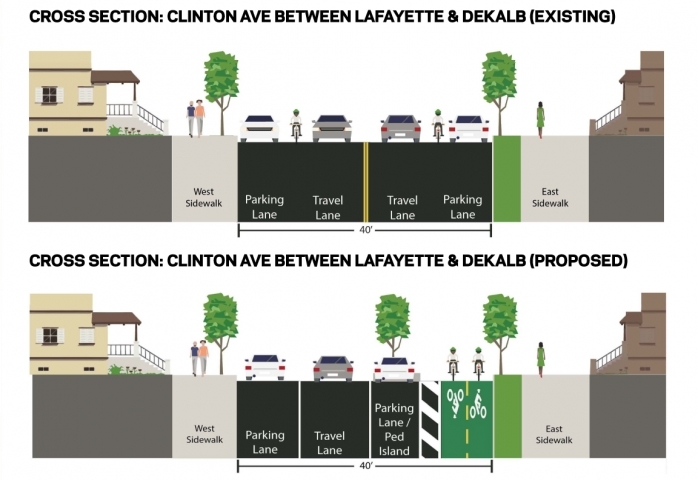 The redesign would add a two-way parking protected bike lane on Clinton between Flushing Avenue and Gates Avenue, converting the street from two-way motor vehicle flow to one-way northbound. In addition to creating a low-stress bike connection to the Brooklyn Waterfront Greenway on Flushing, it would narrow crossing distance for pedestrians and simplify intersections, reducing the potential for conflict between drivers and people on foot. On Tuesday, Public Advocate Tish James and local Council Member Laurie Cumbo sided with the opponents. After hearing more from the community at this week’s meetings on the Clinton Avenue proposal, DOT will conduct additional outreach with community leaders and residents. We look forward to returning to CB2 next month. If this much effort spawned this much outrage, perhaps DOT should have just gone for it and tried to transform Vanderbilt instead. The primary purpose of the ribbon of land we call roadway right-of-way is conveyance of people from one place to another. The priorities for this land then are; 1) safety for people walking, 2) safety for people riding bicycles or using mobility scooters, 3) safety for people driving motor vehicles, 4) efficiency for people walking and riding bicycles, and 5) efficiency for people driving motor vehicles. These uses are unique in their land use requirements and in their need for central coordination (gov’t). Parking (or car storage) is not an element of conveyance. It does not require this very unique ribbon of land nor does it require central coordination. It can effectively utilize space of almost any configuration. If there is sufficient room for parking once adequate and safe space has been provided to people walking, riding bicycles, and driving then parking can be considered. If that space is not available and NYC feels that they should continue to provide parking then the city should purchase land in the neighborhood for that purpose. politics is rarely about rational arguments. Doubtful. More likely, they’d want to change nothing, and prevent any and all further changes to the neighborhood. The bottom line that I took from the meeting is that the backlash had very little to do with bike lanes. This was a proxy fight about gentrification. And, to be frank, the DOT needs to have an appropriate response to a very valid sense of people not feeling welcome in their own community. DOT *must* address this, or risk having a lot more projects go down in flames. This kind of facility is fantastic, but selling it to people solely on the basis of design features isn’t going anywhere with a lot of folks. Thank you for this observation, it always seemed pretty likely based on reports from the meeting. When will progressive leaders in government learn the obvious lesson: Don’t start with your best, well-reasoned proposal? Always start with some pie-in-the-sky proposal that has no chance, then walk it back to the thing that you really thought would work best in the first place. In this case, they should have started with a proposal to convert Vanderbilt into a bike-and-pedestrian-only grand boulevard all the way from Flushing to Prospect Park. Grass and a thousand new trees would be planted. It’d be like the High Line but on the ground. Car, bus, and truck traffic would all be rerouted onto the various north- and southbound neighborhood streets. All of the parking spaces that went away? No problem, they’ll be made up for with a few paid (but discounted for area residents) garages to be built as part of the developments of Atlantic Yards and Navy Green. New congestion tolls added on Atlantic Ave would pay for it all. Then, when people didn’t like that idea they could have countered with a dramatically scaled back half-measure of a protected bike lane and improved pedestrian safety redesign of Clinton Ave. It’d have been so mundane and low-key compared to the highly disruptive plan on Vanderbilt that maybe, just maybe, all the NIMBYs would have gone for it. Or at least fought it less. That said, I totally agree with BKBedStuy that the meetings revealed the ugly truth: That there is just a LOT of resentment seething below the surface in the neighborhood’s black population. And hey, I’m the guy totally on their side normally, so I get it. But in this case they’re just completely wrong. Bike lanes aren’t about race or gentrification, they’re about a functional transportation network. The old “ask for a pony” strategy. Is there a reason DOT proposed a 2-way bikeway instead of 1-ways on each side? While much better than paint alone and massively better than a door one bike lane, 2-ways are quite dangerous for cyclists going in the contra direction. Drivers always look to their left for someone coming and rarely if ever look to their right. Time to switch to a local traffic street that could also function as a high volume bike route? You would think given the arguments made that the locals would be fine with removing through-traffic from the street and making it local access only. After all, the street is for locals and locals alone. 2-way on one side would take less space than separate 1 ways. There’s a traffic light every intersection, no right on red in general in NYC. There aren’t a lot of driveways on this stretch. Cars turning off of the road can be a concern still. That’s right blame it on the Black residents. it doesn’t matter that just as many whites were speaking out against this ridiculous proposal…..
CBs don’t get to decide.